In October of 2015 I took part in a group reading for the new edition of Philip Whalen’s Prolegomena to a Study of The Universe & Other Prose Takes, a selection of prose poems and outtakes from various Whalen notebooks published by Alastair Johnston’s Poltroon Press. The other readers were Alastair Johnston, Owen Hill, Steven Lavoie, Tinker Greene, David Brazil, and Michael Rothenberg. The event was held at Moe’s Bookstore in Berkeley. Johnston’s press had originally published Prolegomena in the seventies accompanied by Kevin Power’s lucid introduction. The latest edition combines both the Prolegomena with the Power intro and a selection of prose takes recovered from notebooks and published as a little chapbook, in memoriam, after Whalen’s passing in 2002. This edition is also tastefully illustrated with Tinker Greene’s photographs. Johnston’s afterword provides an historical overview of the source of the material as well as the process of their publication. The works represented are from the late fifties and early sixties, and the breadth of Whalen’s field of interest is evident from his titling of work from this period. Not only is there a Prolegomena to the Study of the Universe, there is also Memoirs of an Interglacial Age, published in 1960 by Dave Hazelwood’s Auerhahn Press. Whalen was never one to shy from cosmic concerns and implications. 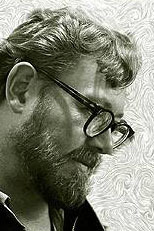 Philip Whalen was a polymath who schooled himself in a variety of subjects and disciplines, from the arcane to the cutting edge, curious and restlessly absorbing information that eventually, through his unique neuronal filtering, found its way into his notebooks as a ramble or observation or rant or spontaneous lyric intellection. Examined closely, Whalen’s work offers a clue to his reading. Timeskip dazzle of China rainking Mafe render serpent wrestling there in the sun man battles time endlessly i.e. a deep space cold/warm quite safe Brineking the pickle magnate but compasses float in alcohol dear Arab World distillery (S. Mary Gyp)(the bain marie a primitive still) they thought it was juice that put them where they weren’t supposed to be among sweet peas and roses brass nightingales. The jumble of tones, dissonant, unpredictable, like an orchestra tuning up or the opening bars of a composition by Henry Threadgill resolve lyrically in a more or less conventional manner: they thought it was juice that put them where they weren’t supposed to be among sweet peas and roses brass nightingales. Yet the beginning is a confounding paratactic mélange of stops and starts, phrases coupled together in a long train of mismatched thought that synthesizes random rumination. Whalen’s hand is at work as he cuts up Mafeking, a significant battle site in the Boer War, to make rainking which then contributes to the internal rhyme of Brineking as free associated states of consciousness unfold or unravel from the fermentation of pickles to a compass needle floating in alcohol which leads to the Arab World distillation of the word alcohol whose source is the original Arabic al kohl. That in turn prompts the parenthetic aside (S. Mary Gyp) which points to St. Mary Jacob also known as St. Mary the Gypsy who had accompanied Mary Magdalene (the goddess Isis) from the eastern Mediterranean to the shores of France in the area around Marseilles and figures in the Holy Grail legend of Languedoc. The bain marie association hinges on the reference to Mary and maintains its arcane source as an alchemical (Arabic) device. Besides the fountains of the Alhambra picking jewels off the marble wall, I was chargé d’affaires then among the windy fragments orangeblossom ladies black white and green a side trip to Ireland, the instantaneous transport of watermelons delivered not later than the 17th of June into the land of Goshen where the water caltrop faints and blooms. and works as an ironic negation of what has come before. It signals a break in the movement, breath before continuing with the improvisation, a grounding before stepping off the cliff into a bed of rosy and/or thorny language petals, stems, and tangles. When I read Whalen’s poetry and attempt to hear his voice in my head, what I imagine is a delivery akin to that of W.C. Fields’ playful pomposity with the pun filled wit of Groucho Marx and the hip musical language improvisation of Lord Buckley. Too often readers expecting conventional professorial rhetoric in poetry are not ready for the learned zigs and zags of Whalen’s shapely mind. He confounds expectations to the point that expectations are best left at home. To anticipate is to trip over your own assumptions. You have entered the PW universe and your orientation will be slightly skewed. Fear not, the path is linear (most of the time) and at the end you will be safely deposited back in your own brain case with the added benefit that you now have something new to think about. 28,29.vii.60 continues after the interlude as an unsubordinated language flow in the form of a list of priestly vestments, alb, surplice, etc, introduced by the Latin Feliks Kulpe, an arcane spelling of the phrase whose literal meaning is “happy fault” and can be glossed as “fortuitous accident” or “chance”. But one must not be diverted by these little eddies and side galleries as the religious terminology rapidly moves from Russian emeralds worth a Pope’s ransom to the listing of exotic locations such as the Taj Mahal, and Sanchi Tope whose sonority becomes their purpose (a French submarine, a mandoline) then resolved as a Pentecostal image of divine enlightenment in such matters as the alphabet, the musical saw, the art of marriage and the packsaddle are conveyed to our (man’s) consciousness. The scene then shifts to a high point in the landscape, Smith Tower and looking out across Elliot Bay in Seattle, whose view induces New Testament diction, verily verily I say unto you (John 3:3), although the subject of the inspired speech is electromagnetic induction, a toroid antenna, and oscilloscopes. Here Whalen’s training as a radio operator and instructor in the Army Air Force provides the knowledgeable lexical frame of reference. With the same mock affectedness, he continues but now the naming consists of internal body parts, the adenoids, the tonsils, the vermiform appendix (adenoid apparently triggered by the earlier toroid). Then in a parenthetical aside Whalen introduces a semantic flip switcheroo (technical term) that vectors the prose in an entirely different direction: (scituate at or near McBurney’s Point one clear and cloudless afternoon. . .). At first scituate might appear to be one of two things: a creative or archaic spelling for the word situate whose pronunciation is slightly warped by the vowel following the two consonants or that it is the name of another internal body part. Yet it is somewhere “at or near McBurney’s Point”, and where exactly is that? This is where the literary legerdemain occurs. McBurney’s Point is the name given to the point over the right side of the abdomen that is one-third of the distance from the anterior superior iliac spine to the umbilicus (navel). And scituate, puzzling in its lower case predicate cloak, once made a proper noun becomes Scituate, a seacoast town in Plymouth County, Massachusetts, United States, on the South Shore, midway between Boston and Plymouth. This arch playfulness is prevalent in Whalen’s work though this particular piece may be an extreme example. Suffice it to say that the sources of his jottings are often extra lyrical or appropriated from his wide and obsessive reading. As a poet he is the repository of strange and arcane lore. It was speculated the night of the group reading that perhaps Whalen was following his contemporary, William S. Burroughs, in using the cut and paste technique. Perhaps, but the poets and writers of Whalen’s coterie were inclined to follow Ezra Pound’s exhortation to “make it new.” Whalen described his old pal Jack Kerouac as an “experimental writer” and there is no doubt in reading Whalen’s oeuvre, especially this piece, that he had a similar predilection for pushing the accepted envelope toward the forging of a new American poetry. The text is then lifted verbatim from (I’m guessing by the formality of the language) a 19th Century admonition: The result is best left to be described in pages other than these, in some work reserved to the perusal of men versed in the knowledge of the physiological disciplines. This passage is immediately mocked in the tone of Whalen’s own hyper testimonial pitch beginning Know ye, my children, and bringing in the previous association with radio electronics and pairing it with high church references: that the way from the transistor to Edward the Confessor is both easy and unnatural, and continuing in this manner of moral injunction with Forego spectacles and avoid the sight of evil. Do not uncover navels. Please put the feather bottle on the whatnot. Once again, as the last sentence illustrates, Whalen relies on a lighthearted sonority to wrap up a movement in this composition. What follows is an interlude of sorts in the form of a notation by a fictitious ornithologist on a monograph about crossbreeding dragonflies in Prince Rupert Sound. While keeping the quasi elevated tone of the previous section, it provides a distancing humor in the form of academic stuffiness. But soon enough the reader is led back into the fray by an ellipsis and reality limits approaching infinity without the use of twins. A dose of lycopodium to induce invisibility, the end of summer lightly boxed, the Atlantic a sheer fabrication, a recidivist world of eucalyptus wombat heaven. Whalen’s humorous pronouncements end with a lyrical word salad in which recidivist sounds a contrapuntal harmonic with eucalyptus, and world enables wombat heaven. 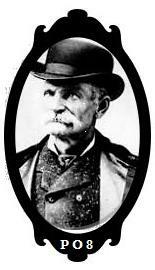 Whalen’s ear and his incongruous constructions determine much of what has gone on thus far. Out of chaos comes order (more or less). On the other hand, it is useful to note another determining factor, and that is the fact that Whalen’s texts are handwritten, and in a graceful italic calligraphy. As the seemingly random assemblages indicate, no tangent is too quirky to be followed. A similar fluidity is present in the act of conscious penmanship, the joining of one letter to the next, precisely and elegantly, aware only of the shape and form, its lexical significance a secondary concern. To paraphrase Wittgenstein, his head often was not aware of what his hand was writing, and the liquid loops of ink on paper were an end in themselves. Calligraphy is what I am reminded of at this point. All in caps Whalen announces LATER THE SAME THURSDAY as if it were a placard in a silent feature. On the notebook page it must have been rendered with the arabesques of imposing calligraphic pomp. Following this announcement, text elements fly by like odd items caught in the swirling updraft of a twister: Roses all year round [. . .] airforce blue milkbottles [. . .]anemones and the old siren voices boiling beeswax. Think of the calligraphic potential of phrases like “Roses all year round” and words like airforce, milkbottles, anemones and beeswax—oh what fun! And progressing toward the lyric denouement, Stevenson’s Treasure Island is evoked (pieces of 8, Darby Graw) as are numbers (40, 109, 95), and any number of random associations (tennis scores, tundra oxen) hurtling toward the crescendo of Everybody keeps trying not to stop me but I have run out of tape. This last sentence is conclusive. The assumption also is that the “tape” belongs to a tape recorder, further reinforcing the spoken/musical characteristics of the piece, or it is wrapping tape used to glue together all the words of the collage—my preference is for the former. The conclusiveness is supported by the fact that Whalen at this point leaves the left aligned conventions of prose and opts for poetry’s open field. With it comes a change of tenor. The multiplicity of voices and tones dissolve into a reflective mode as if the orchestral cacophony had gone silent to allow the soloist room for a quiet etude. I’ve been to El Paso. So the war was over. With the end of the war, Whalen’s enlistment was also over, and he reflects upon that moment some dozen years later. Texas and New Mexico was the terrain over which the training missions were flown, landing in Alamogordo, and El Paso, possibly the last destination as the war came to a close. and I am pink gum all over. The physicality of the action is supported by further calligraphic emphasis of the word STRETCH. And all that has come before requires a conclusion, a harmonious resolution, a way out of the lexical maze and into the light of comprehension, a moral as spoken by a Greek chorus and in what I hear as Whalen’s authentic voice. The upshot of this evening in which everyone acquitted themselves marvelously in serving up the erudite, sometimes obscure or arcane, always delightful prose of the Prolegomena to a Study of the Universe was the resolve to do more readings of Philip Whalen’s work, and regularly. Since the date for this particularly reading was close by a few days to Whalen’s birthday (October 20th), it was suggested that on that date in 2016 we all get together for a marathon reading of Whalen’s book length poem, Scenes from Life at the Capital. Details to follow. 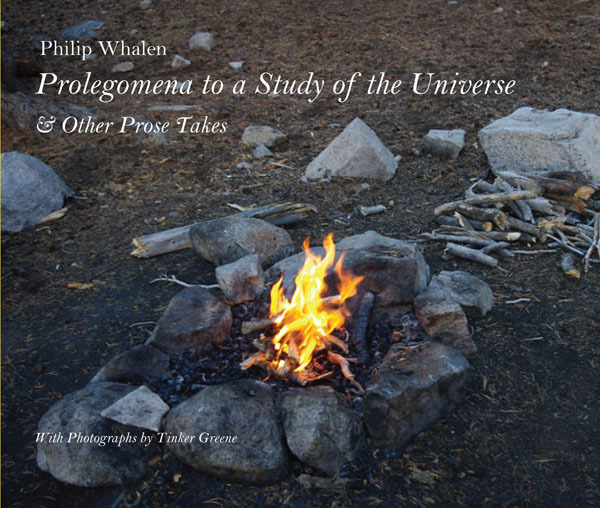 Prolegomena for a Study of the Universe is available only from the publisher, Poltroon Press. Please see their website for ordering information. Pat Nolan is a charter member of the New Black Bart Poetry Society and was founder of the original Black Bart Society as well as co-editor of its newsletter, Life Of Crime. He currently maintains the NBBPS blog, Parole. Life Of Crime, Documents in the Guerrilla War against Language Poetry, a compilation of all the original Society newsletters, was published in 2010 by Poltroon Press. Nolan’s latest book is Poetry For Sale, Haikai no Renga, now available from Nualláin House, Publishers. This entry was posted in Poetry, Poetry Society and tagged Black Bart, David Edelman, Ezra Pound, Gary Holthaus, Jack Kerouac, James Haug, Jim Wilson, Joel Dailey, Modern Poetry, outlaw poets, Philip Whalen, Poetry, Poetry Blogs, Poetry Lectures, Poetry Lessons, Poetry Society, Poetry Talks, Poets, Poltroon Press, Samuel Green, Sandy Berrigan, Schools of Poetry, The New Black Bart Poetry Society, William S. Burroughs. Bookmark the permalink.